Last evening at midnight, all of the scientists held a meeting where each group reported on their findings up to this point. It was a chance for scientists to ask questions of each other. 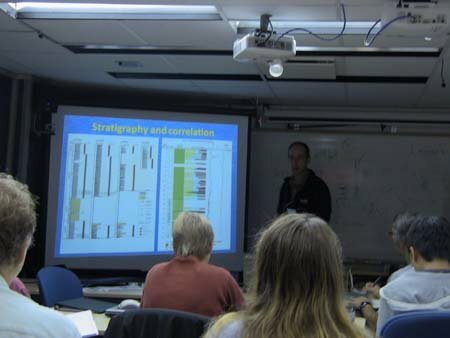 Interpreting the data will take some time, so it is not like the expedition’s objectives have been fulfilled. As data was presented, there was some speculation as to what all the graphs and charts meant, but there is still much to do. As we collect cores from other locations, they will be compared and contrasted with those from the first site to see if that sheds any light on what the data is telling us. The scientists worked diligently all day, huddled in groups at times, preparing their reports for the evening’s meeting. It is amazing how such detailed presentations can be prepared in such a short amount of time. These meetings are held at the end of each site.